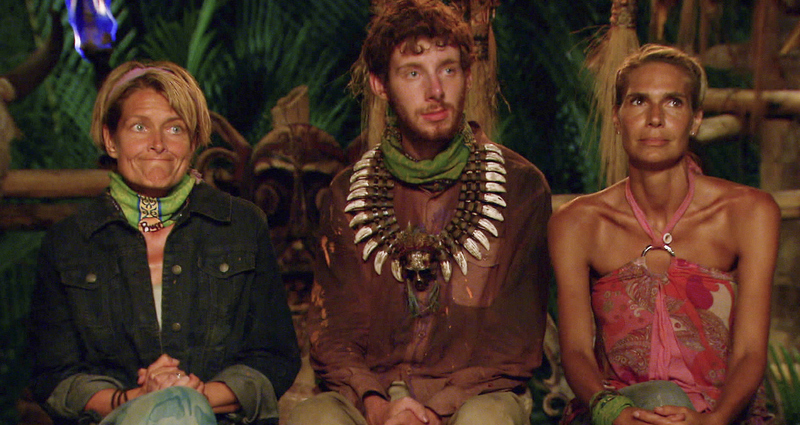 Final 3 at tribal council in the Season 26 Finale "Last Push"
Dawn Meehan, John Cochran and Sherri Biethman at Tribal Council. With the title of Sole Survivor on the line and one million dollars within arm’s reach, one castaway falls victim to a heartbreaking medical emergency, on the two-hour season finale of SURVIVOR: CARAMOAN – FANS vs. FAVORITES, followed by the live one-hour reunion show hosted by Emmy Award winner Jeff Probst, Sunday, May 12 (8:00-11:00 PM, ET/PT) on the CBS Television Network. Photo: Screen Grab/CBS © 2013 CBS Broadcasting Inc. All Rights Reserved.